Clubs and Personal Sites. From around the world. 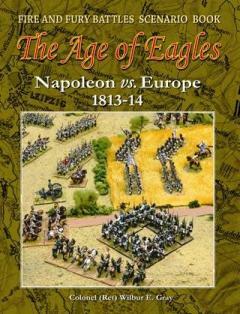 AGE OF EAGLES Bill Gray, who is a good friend of ours and a long-time wargamer, has developed AGE OF EAGLES, an authorized conversion of the brigade level Fire and Fury rules to the Napoleonic period. He has just released a new scenario booklet and you can obtain it and the rules themselves by going to the AGE OF EAGLES website (he accepts PAYPAL). HMGS PSW Pacific South-West chapter. Mapping Board Release Version (0.9.1.1) Mathew Tyler's shareware mapping utility. A great tool for the scenario designer. While free, he asks for a donation if you use it. Mr. Tyler gave me permission to distribute the Beta Version (0.9.2) and Documentation I developed. Wargamer The Wargamer is a great site for the computer wargamer but it also covers board and miniature gaming as well as military history. Our Movement to Contact section has links to over 300 of the best wargaming sites on the Web. Felix's Gaming Pages A site in the UK with lots of items of interest to wargamers. Web-Grognards "The site for wargames on the web." This site is devoted to all aspects of wargaming and contains a large number of features, reviews, errata, and lots and lots of links. Battlefront E-group A discussion group dedicated to the 15mm Battlefront miniatures line AND our rules. The Miniatures Page A web-magazine devoted to miniature wargaming. A site devoted to military modeling. Lots of good paint schemes and techniques. A new site attempting to start a talk/chat forum for gamers. It has a Battlefront section. Independent, unbiased single and multi-product reviews of miniatures and wargame rule sets. Comparative, up-to-date information gleaned from working with the products. Russian Battlefield Formerly known as the Russian Military Zone, this site from Russia (in English and/or Russian) is devoted to Russian military history. Documents, Wartime photographs, camouflage patterns, and more. Check this one out. U.S. Army Center for Military History. The CMH is the official Army publication site. There are several publications on-line here as well as order forms for others. U.S. Army Heritage and Education Center The website of the U.S. Army Heritage and Education Center. AFV News A site containing lots of information about armored vehicles for the modeler and history buff. NORWAY 1940 A site devoted to the history of the Norwegian Campaign. A site devoted to armoured warfare. Achtung Panzer A site devoted to German Armor. France '40 A site devoted to the campaign in France in 1940. Imperial Japanese Army Home Page A site devoted to the IJA. German Armed Forces The history of the German armed forces from 1919-1945. Guns Vs Armor Armor Penentration and performance data for most of the major weapons of WW2. Note that it is best viewed with a browser that zaps advertisements. Artillery in WWII The employment and techniques for using artillery. Axis History Factbook Includes information on all aspects of Germany and her allies during World War II. Dutch East Indies Website History site devoted to the Pacific battles of 1941-1942. Princess Irene Brigade History of the Royal Netherlands Brigade "Prinses Irene". Click on the flag at the lower left for an English translation. World War II Magazine The website for World War II and Military History Magazine. It contains the text of many of their older articles. Military History On-line A general Military history site with a good WWII section. Armour In Focus A site dedicated to AFV photography and research. Warlinks A site devoted to WWII history, primarily from the British/Commonwealth viewpoint. Includes lots of good information, including memoirs. The Drop Zone Calling itself a "Virtual Museum", the Drop Zone is a collection of oral histories from the veterans of World War II. Polish Armour The premier Polish armor site. Yahoo Group:France 1940 An interest group dedicated to the France 1940 campaign. Winter War An excellent site dedicated to the war between the Soviets and Finland in late 1939 and early 1940. Finnish Armour If you are thinking of using a Finnish army, especially for the post-1939 battles (the "Continuation War"), make sure that you visit this site. Also, for modellers interested in getting "up close and personal" with the StugIII, this site is for you! It has TONS of photographs of Finnish armored vehicles, often with individual vehicle histories, and descriptions of the color schemes used. Jaeger Platoon Lots of information on Finnish equipment and history in World War 2. World War 2 Vehicles Lots of nice vehicle pictures and data aimed at the ASL player. Battalion Organizations Gary Kennedy's sites has interesting information on the organizations and tactics of the various nations at the Battalion level and below. Hyperwar A "linkfarm" of World War II articles/features on the web. French Tanks In French. Lots of good pictures. Doughboy Center - US Army in WW1 US army role in First World War. Liots of useful links. The Infantry in Battle paper is well worth a look and has lots of good scenario ideas. Other links well worth a look as well. Polish First Armoured Division A site dedicated to the Polish contribution to the campaign in Northern Europe. Note-have your popup blocker on when you go here. Canadian AHQ Reports Army Headquarters (AHQ) Reports (1948-1959). A series of historical documents compiled by the Canadian Army, many of which are detailed accounts of their WW2 experience. Danish Army Vehicles This site is devoted to the Danish Army Vehicles, past and present. Scandinavian Armor This site is devoted to the modern vehicles of the Norwegian, Swedish, and Danish forces. History of War An on-line encyclopedia on military history. War Over Holland The history of the Dutch experience in WW2. Gary's Combat Vehicle Reference Data on modern weapon systems. World War 2 Day by Day Information on the German Army. In German, but the graphics are easily understandable. Topographic Maps The Library of Congress Map site. Japanese in Battle A site devoted to the Japanese forces in WW2. The Crusader Project A site dedicated to the Crusader Battle in N. Africa. Fort Sill Field Artillery Journal Archives On-line archives of the Field Artillery Journal-a magazine that has been produced since the early 1900s. Lots of excellent articles in the World War 2 era - all produced within months of the events. Note that the PDFs are very large, so expect long download times. Panzerworld Another site with some interesting info on German Armor and equipment. Cars, Trucks, and Airplanes An introductory site with information on military equipment and some general WW2 history. U.S. Rationing Programs in WW2 A site about U.S. rationing programs during WW2. I thank the young reader who suggested it. Charge! ACW newsletter/ezine Scott Mingus has been running this site for several years. It is a source of good ACW scenarios, history, and hobby information. Miniature Painting Forum A blog/forum dedicated to miniature painting. 6sided Wargaming Blogs 6sided offer blog accounts exclusively for miniature wargamers. It's just like blogger.com for example, but you are in a network of miniature gaming blogs, so you benefit from more traffic. So if you are thinkin of blogging, or want to import your current blog from another bloghost, please try us out. Houston Area Miniatures Society A club in Houston, Texas that puts on lots of Battlefront games. Members include regular contributors Rob Wubbenhorst, Brian Cantwell and others. Lots of photos of games in progress. WARPLAY LLC Fred Schaller's site dedicated to Military History and gaming. World War 2 Zone This is a forum for WW2 buffs and wargamers. Micro Armor Mayhem A site devoted to micro armor, with lots of pictures of the offerings of the major manufacturers. Battlegroup South A UK club with lots of photos and activities. 10mm Wargaming Andrew Bruce's site devoted to 10mm gaming with lots of links and articles. Gaming Models Gaming models features a fairly large line of inexpensive resin cast models with the average cost being approximately 5 USD/vehicle. They come painted a basic color or unpainted (per customer request) and are designed for gaming rather than display. However, from what I saw at a recent convention, with a little work they look almost as good as their metal counterparts at about 1/3 the cost. Craig also has a line of Landing Craft and Amtraks (in both waterline and out of water configurations). The Last Square One of the larger wargame stores, this company has a large line of miniatures, books, and modeling supplies. It also owns the rights to Don Perrin's old 10mm line. SkirmishCampaigns This company is publishing scenario booklets and scenario generation system for WWII. So far they have done France '40, Norway, and the Early Russian Campaign. As we and they expand our product lines to cover the entire war, I am sure you will find their publications an extremely useful accessory to Battlefront WWII. Old Glory The Basic Old Glory website. They own the Command Decision line. Old Glory/Quality Castings One of the major lines of 15mm Figures and equipment. This company was recently acquired by Old Glory 15s. The Nafziger Collection A vast source of order of battle information and other interesting historical reference material. True North Miniatures True North Miniatures (TNM) specialize in early war and "oddball" troops, including the Poles, Dutch, Belgians, French, Hungarians, and Romanians. TNM was taken over by Old Glory, and their line can be found on the OG website. Brookhurst Hobbies Brookhurst Hobbies. One of the premier wargame suppliers with an excellent website. Warzone Gaming Terrain Systems War-Zone Gaming Terrain Systems: High quality terrain for your favorite game. Europa Videos These are a series of videotapes on World War 2 topics from the Europa Game site. Your humble webmaster bought 4 of them and is very impressed with their content. You may also contact Tom Johnson for ordering information. Outland Games A small miniatures manufacturer with some interesting wares. We met them a the Cold Wars 2002 convention and will probably feature some of their miniatures in our Blitzkrieg supplement. Note:Go to their "Order" page to see their catalog. If their website doesn't work, email them here. FiguresArmourArtillery USA After working on their 20mm vehicles for our early-war supplement, Mark Hayes is convinced that this company has among the best of the 20mm miniature lines. The link is to their US distributor, but they have contact info for the UK as well. Crusader Miniatures One of the figure designers from Wargames Foundry has started his own figure line. His new offerings include some 28mm figures from the Blitzkrieg period. Armaments in Miniature This little company produces a line of resin cast 15mm Aircraft, including their new Henschel HS-129 Tank Buster. They paint up rather nicely. Cherry Hill, NJ 08034 A source of collectable 15mm diecast metal aircraft. These look very nice and do not need to be painted. No website, but they have an email address. TMTerrain A company in the UK who specialise in making high quality custom made terrain and buildings in any scale and also offers a quality figure painting service. They are featured in the September (2002?) issue of Wargames Illustrated. Camelot Games This Italian company features a line of Desert Italian figures. Litko Game Accessories This company manufactures a line of magnetic bases and other useful accessories for miniature gaming. Flames of War Battlefront Miniatures (as opposed to Fire and Fury's Battlefront:WW2-but that is a long story), now publishes a rules set called "Flames of War", and this website supports it. Even if your primary rules are BF:WW2 :-) , the FOW rules are worth buying for the painting and modeling tips. The website continues this trend as they have lots of step-by-step instructions and color guides and it is well worth a visit. This is also where you can buy direct from Battlefront miniatures (where they WILL be in stock), and your not-so-humble webmaster can attest to their service being excellent. Warweb/Grandiosity Grandiosity's on-line store. Lots of hobby supplies, including Vallejo paints. Stronghold is a Scotland based company that manufactures the historical ranges previously carried by Pioneer Miniatures (15mm), Victoria Miniatures (10mm) and Village Green Models (resin cast buildings and scenics in a variety of scales). They also carry Yxor 15mm figures, the elusive SDD Models, Vanguard Models, and Micromark army lists. Your not-so-humble webmaster has received very good response from them. QRF Miniatures One of the major manufacturers of 15mm figures and vehicles. Total System Scenic Terrain for wargaming, associated with QRF. Peter Pig Miniatures Another of the major manufacturers of 15mm figures and vehicles. Heroics and ROS 5mm Figures and vehicles. IMHO, these guys make the best infantry for 5mm. They have been sold twice since their original owners retired and are now produced by Andy Kirk in the UK. GHQ 5mm Figures and vehicles. The GHQ vehicles are superb. CINC 5mm Figures and vehicles. High quality castings. Scotia Micro Models 5mm Figures and vehicles. Some Unusual Vehicles to fill out the collection. Eureka Miniatures An Australian company with a highly rated 15mm Figures including Desert and Pacific Australians and some Chinese. Irregular Miniatures Although most of Irregular Miniatures miniatures line is outside WW2, they have a 15mm line of "Really Useful Guns" that might fill in the requirement for an odd piece of equipment, especially for the non-mainline armies such as the Finns and Chinese. Resistant Roosters A new company producing 15mm figures. RH models This company features several lines of 20mm. Liberation miniatures are modern (Korea and later), Bandera miniatures (Spanish Civil War), Axal (WW2), and Little Green Men (SF). Ironclad miniatures This company features some modular terrain, including trench systems and bocage. Sea Scalpel This company features very nice sea terrain mats, with lots of options for adding lands, beaches, etc. ZUZZY Miniatures Wargaming Terrain ZUZZY Miniatures is the manufacturer of resin cast wargaming terrain and Terra-Flex rubber wargaming mats, paintable and flexible latex rubber gaming mats with an ultra-realistic sculpted surface. Their main focus is on 25-30mm scale, but much of their scenery is suitable for use with a much wider range of scales. Their highly detailed terrain is themed so that their battle mats match the terrain that goes on them. Their slogan is "We don't make your figures, we make the world your figures live in." and it's true. Kerr and King A new company with lots of resin cast terrain and some interesting resin cast vehicles as well. A good source for German halftracks. Pico Armor 5mm armor and infantry. Their WW2 line concentrates on the early war/Blitzkrieg era. Monday Knight Offers pre-flocked terrain mats, buildings, and other accessories. Gamecraft Miniatures Features "mix and match" buildings, with different ends and sides you can use to construct your own houses. Paper Terrain Features paper wargame buildings and accessories. They also plan to carry a set of paper miniatures designed for RF&F. Noble Knight Games and Gaming supplies. CP Models Miniatures A company in the UK with an interesting 20mm WW2 line of straightforward Germans, Italians, Finns as well as fantasy figures and a additional "Wierd WW2" selection (yes, they have German zombies). Forged In Battle A new line of 15mm miniatures. Plastic Soldier Company Source of some of the new 15mm plastic tanks - a low cost alternative to metal. Wargamers Terrain A U.S. based company featuring a line of flexible roads and rivers, as well as a variety of hills and stone walls. Sargent Major Miniatures A U.S. based company (Maryland) featuring miniatures and hobby supplies. Buildings in Turmoil A U.S. based company (Pennsylvania) featuring buildings for wargaming (both painted and unpainted). Some are specifically made for the Gettysburg battlefield (the company is based in Gettysburg). Cigar Box Battles A new company producing Terrain mats. Fernando Enterprises Painting Services This company is based in Sri Lanka and their website advertises several levels of painting detail at VERY reasonable prices. Neil Kenneally has a painting service based in Bangladesh. He says "Artis Faber present Reinforcements by post (tm). Miniatures painting service. Reinforcements delivered discretely to your door, the enemy will not be informed. Miniatures painting service with excellent quality, good prices, and quick turn around.". Tankograd Publishing Jochen Vollerts site which is a source of armor/war related materials. His gallery has a lot of good pictures of tanks and AFVs. On Military Matters OMM is one of the more well-established on-line book and magazine dealers specializing in military topics. They have an extensive inventory of used and new books on military topics and also are the U.S. distributors of several magazines, including Miniature Wargames. Your not-so-humble webmaster highly recommends them. Aberjona Press I discovered one of their books by accident at a local bookstore and was extremely impressed. This company is a small publishing company that specializes in high-quality military history publications. You can download the maps in their books from their site as well. Your humble webmaster highly recommends "Seven Days in January" and is eagerly awaiting some of their other offerings for his personal collection. History Bunker Providers of reproduction WW2 uniforms and equipment as well as CD collections of Military photographs, documents, ID cards, propaganda posters, maps, radio broadcasts and speeches. We also stock flags, banners and military music. A day in a Tank If you feel the urge to drive around the English countryside in a tank, this company can provide the experience using actual vehicles. Want to have your website listed here? email us. Send the title of the site, the URL you would like us to use, and the description you would like to see. Hobby-related and Military History sites are welcome. If we like your site, all we ask in return is that you include a free link back to our site. We will send you back our link information and we can trade links. We can also trade small graphic logos.